I joined Pinterest in the spring of 2012. Since then, I have pinned hundreds of recipes. I've also tried the majority of the recipes that I've pinned. I've pinned so many recipes that I've had to create more and more recipe boards just to keep up. Pinterest has been a wonderful resource for me when it comes to cooking and baking. This is a great thing, and it's definitely saved me money by finding me some low coast recipes to make at home. I like to keep it simple when I pin recipes. I try to stick with easy recipes that have simple ingredients. I also try to look for healthy recipes, at least somewhat healthy. (Sometimes pictures can look so delicious, I just have to try them!) And of course, I'm always keeping in mind price. 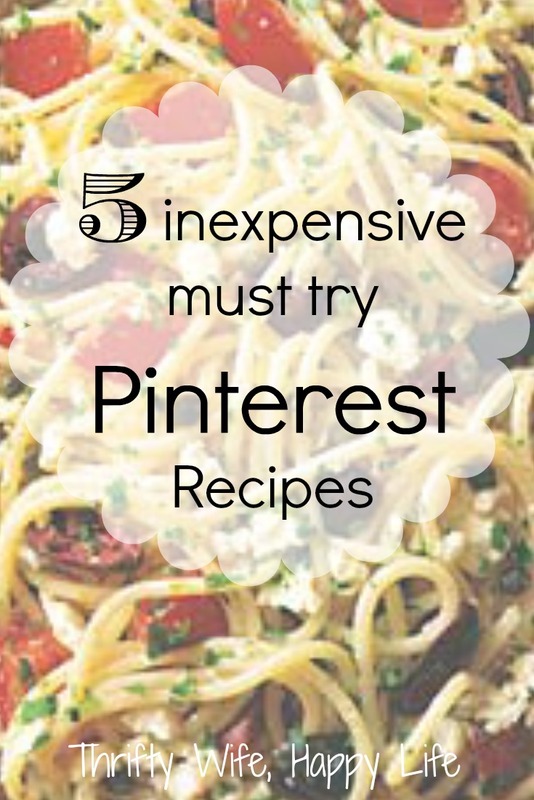 I wanted to share with everyone 5 of my favorite Pinterest recipes! 1.) 15 Minute Creamy Avocado Pasta- This is by far one of my favorite recipes. It's so easy to make and delicious. It's perfect for a weeknight meal! I've adjusted the recipe a bit, leaving out the fresh basil and lemon zest, but you really could make it however you like. I top mine with Parmesan cheese. 2.) Spaghetti with Tomatoes, Black Olives, Garlic and Feta Cheese- This is another favorite pasta recipe of mine. I tend to make a lot of pasta dishes because of the price of pasta. It's so cheap to by a box of whole wheat pasta. Plus, pasta is so easy to make. This pasta dish has a great Mediterranean taste to it with the black olives and feta. It's another great weeknight meal. 3.) Lemon and Dill Chicken- I forgot how good this meal was until I made it the other night. It's super low in calories and delicious. I like to make it with mash potatoes and steamed green beans (I buy the frozen bag from Trader Joes for $1.99 and they last me a long time). 4.) Balsamic Roast Beef- This is a great crock pot meal. I love using my crock pot! Especially when it comes to cooking meat. This is a delicious recipe if you are looking for some new flavoring for your roast beef. 5.) Crock Pot Chicken Tacos- This recipe changed the way I make tacos. It's so easy and I love the way the meat turns out! If you only try one recipe from this list, try this one for sure! Those are just a few great recipes I've discover. If you're looking for more ideas, feel free to follow my recipe boards on Pinterest.